Water has, in some ways, been our nemesis this summer. Not the water outside the boat, but the water inside the boat. The first episode was very early in getting the boat ready for the summer. The fresh water system in the boat includes a small water heater. This heater has a dual source to heat the water. If the engine is running, it steals some of the heat from the engine to heat the water. If we are plugged in, then it is heated by electricity. It has a reservoir of only a couple of gallons of hot water, but for two of us, it’s usually plenty for our needs. To prepare the boat for the winter, one of the tasks is to drain the hot water heater. To do this, first the water intake to the heater has to be removed to prevent more water from coming into the heater. Then the drain opened on the bottom of the heater to let out the water that is in the tank. In spring, the process is reversed to fill it with water again. Except when I hooked up the heater, I forgot to close the drain. When I turned on the water, I thought that it was taking quite a while to fill the heater. Of course it was – whatever I put in the top was just coming out of the bottom again. So, this oversight dumped quite a load of water into the bilge. There is a bilge pump, but this is designed to remove water threatening to cause serious problems. The bilge is composed of a number of compartments that all drain into the lowermost compartment, where the bilge pump is located. However, they do not drain completely in a case like this – they all retain some water. And, of course, the hot water heater is almost as far from the bottom bilge as you can get in this boat. So, we had to open up the floorboards on almost the entire boat and clean the water out every compartment, a tedious process that takes a couple of hours and some unusual contortions to reach all the corners. Once I finished slapping my head for this foolish oversight, we pressurized the system again and everything worked fine. At least for a couple of days, until a hose junction popped off at the hot water heater. The water pump that pressurizes the system is fairly quiet, so it was running for some time before we even heard it. But with the hose disconnected, again a good quantity of water was dumped into the bilge. In my defence, this wasn’t one of the connections that I had been using – it was one that worked itself loose over time. So, this led to a second round of opening up all the floorboards and cleaning the bilges. Shortly thereafter, we left PEI and were bound for Ontario. One of the great benefits of this boat is that it has a shower with plenty of room. We were doing our second overnight passage, and Michelle decided to take a shower. On a boat, there is a switch panel that runs the various electrical components. This totally shuts off the power to the various pumps, lights, and outlets, and you only turn on the ones that you want to use. The drain for the shower is attached to a pump (since it’s below the water line, it can’t just drain naturally). So, when Michelle took her shower, she turned on the switch for the shower pump. However, this switch also provides power to the bow washdown – a system which was added to provide water through a nozzle to clean the anchor as it is being pulled up. 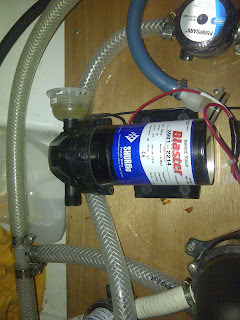 One of the connections for the washdown came off and again pumped water into the bilge. Although this wasn’t quite as far from the centre of the boat as the hot water heater, this was not pumping from the fresh water tanks, but straight from seawater. So in this case, we not only had to get the water out of the bilge, but because it was seawater, we had to clean out these compartments with fresh water. Also, one of the compartments it showered is where we store the canvas for the boat, so we had to wash off the canvas with fresh water and put it out to dry. Now, to dispel the myth that things come in threes, our fourth incident was a couple of days later. We turned on the water pump, and a few minutes later, Michelle noticed that it was still running even though we weren’t using the water. Again, a fresh water line had come off. Again, we had to clean bilge compartments, and again the canvas got wet and had to be dried. At least this time it was fresh water. Finally, just a couple of days ago, we noticed that the pump would cycle for a few seconds every couple of minutes even though we weren’t using the water. This is what happens if there is a small leak somewhere in the system – the drops of water coming out will eventually depressurize the system, and the pump will run for a second or two to re-pressurize the water lines. So I investigated every connection, and there was no leak. Finally, I thought that maybe the pump itself was the problem. The water pump has a one-way valve that keeps water from running backwards through the system. If this was leaking, the same thing would happen. So, to test this, I shut off the water supply at the source, drained the input line, and watched. Sure enough, water was coming backwards through the pump where it shouldn’t have. So, here was a new project. After a bit of on-line research on these pumps, I disconnected it and took it apart to look at the seals. 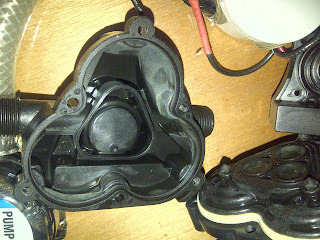 Everything looked all right, but the seals were a bit dirty, so I cleaned them and reassembled the pump. I then turned it on, re-pressurized the system, and it ran continuously. It seems that in reassembling the pump, I had adjusted the internal pressure switch to the point that the pump would not stop. And of course, this was a difficult adjustment to reach where the pump is mounted. So, it took out the pump again. On the bottom of the pump are five screws – four of which hold the switch in place and a fifth that adjusts the sensitivity. All I had to do was loosen the screw a bit to loosen the switch, and when I put it back in, it worked! So, after flooding the bilges four times and dismantling a water pump, our water woes are taken care of (knock on wood). But on the plus side, you’d be hard pressed to find a boat that has cleaner bilges.